Caching files is done so that they are immediately available (for example to open them for editing) and makes sure that no time is lost by first having to download them. Files that are kept in the cache can also act as a backup in case something goes wrong with the original file. When cached files are not needed anymore they should be cleared from the system to free up disk space. Info: This feature requires the Swivle InDesign client 3.5.1 or higher and is available for InDesign for Adobe CC 2017 or higher. 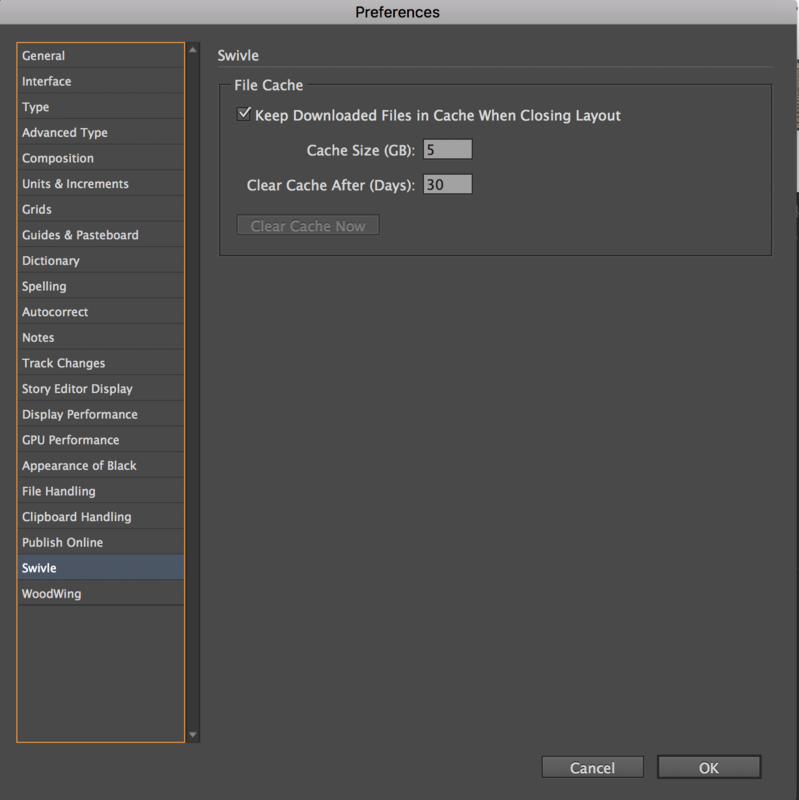 Managing cached files can be done by using the File Cache option that is available in InDesign Preferences > Swivle. It controls if files that are cached should be kept in the cache folder when the layout that they are related to is closed. Additional options control the maximum file size of the cache folder and how long the files may stay in the cache folder. Enable. Controls if the option is enabled or disabled. The option is enabled by default. Cache size (GB). Controls how big in file size the cache folder can be. The default size is 5GB. Clear cache after (days). Controls how long a file can stay in the cache folder. The default period is 30 days. Clear cache now. Allows to manually clear the cache folder. Note: To use the Clear Cache Now button you have to be logged in to Swivle (Swivle > Log In...). This is needed so that Swivle knows for which user the cache folder should be cleared. In this section the working of the options are described in more detail. When closing a layout, any cached files that are related to that layout are removed from the cache folder. Files that are downloaded by the Swivle InDesign client and that related to any of the open layouts are also removed. Note: To use this option you have to be logged in to Swivle (Swivle > Log In...). This is needed so that Swivle knows for which user the cache folder should be cleared. Use this option to manually clear the cache folder. During this process, the preferences for the folder size and the time that files can be stored in the folder are not taken into account.